If we had any regret whatever at the Confirmation on Passion Sunday it was that the rebuilt organ had not been able to be completed in time. Never mind, despite this, all went very well indeed. Below is a photo, by David Lee of the candidates and the Bishop of Grimsby assembled by the tower arch before the service. A list of those confirmed appears on page twelve: please continue to pray for them in the months ahead when they are learning to settle down as communicant members of the Church. 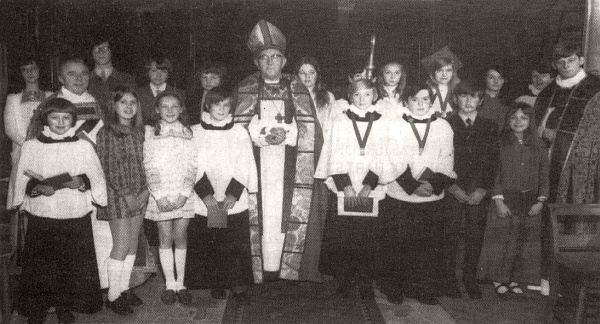 Confirmation picture shows the Bishop of Grimsby and curate Richard Emerson. Sally Anne, daughter of Christopher John and Pamela Morrison, 11, Yarborough Court.